By anne, March 9, 2009 at 2:25 pm . 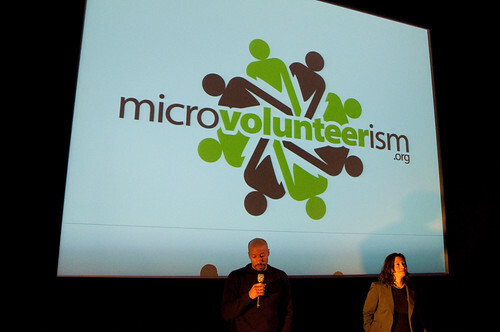 The Microvolunteerism network began their presentation with the movie Poison Fire by Lars Johansson in order to provide a context for their work. The dramatic movie shows that oil has brought the Niger Delta Zone a curse, instead of wealth. What is the role of networks in this tangle of creeks and oil pipes? Both social and technological networks can be used to inhabit institutions. The long-term aim of the project is to map and track environmental and human rights issues in the Niger Delta. And also to mobilize the people in the region to form communities and networks that can help with the mapping and tracking and use that data as a platform for campaigns. Microvolunteerism has brought various networks together and in the constitutions they have mobilized other institutions. The relation between networks and institutions serves as an instrument to achieve their goals. It is important to get a sense of the nature of the role of institutions. In Nigeria for example there is a democratic framework. They want to inhabit the (existing) institutions and use networks to develop a platform that will allow people to recognize themselves in the institutions. Microvolunteerism acknowledges that there are a lot of different people with a lot of different talents. During their sessions they had several visitors from different disciplines: hardware hackers, firmware / software developers, web developers, new media people, advocates, documentary makers and artists. The power of Microvolunteerism lies in being able to bring these people together and have these people make their own specific contribution. There are different components to approaching the Nigerian delta project and its problems. There is a need for understanding the hardware, how can we protect and secure the data, how can we use it to lobby / to make change and to put pressure on the oil companies and governments. Finally, how can we create artistic expression to move other people to also care about this issue and help us? However, the problem with families is discipline. How to use a vehicle that relies on volunteers, coordinating microtasks and how to use a network to run a campaign? It is difficult and involves an architecture that coordinates the network. There needs to be preparations in advance and a concrete vision of what the network has to do and this has to be instituted into the architecture of coordination. a tech infrastructure to support this social network. During their meetings they also had an expert on crowdsourcing volunteerwork join them. They raised questions of how can we build a tech infrastructure to support loose contributions that the organizers of the network never comprehended could have existed? There will be loose collaborations on projects. The coordinator is often the bottleneck, he or she does so much that there is an almost inevitable overload and nothing actually gets done. How do we crowdsource so these bottlenecks don’t occur?